I. prize: Martin Opl (CZE), a graduate of the University of Jan Evangelista Purkyně in Ústí nad Labem. 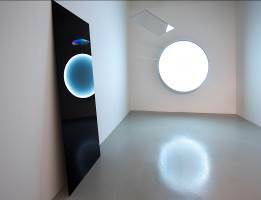 His installation Visible and Invisible, which uses a simple light polarization scheme – polarization by reflection from the glass surface, was chosen by the jury for its excellent work with space, artificial light, and its reflection. The first prize includes a three-week stay for the winner at the Pilchuck Glass School in the USA. II. prize: George William Bell (GBR), a graduate from the Royal Danish Academy of Fine Arts in Copenhagen. His work entitled Specimen of Abstraction was chosen by the jury due to its technical qualities and workmanship, a sort of dynamic canvas of lines, colours, and movement. The second prize includes a work term for the winner at the Ajeto glassworks in Nový Bor and Lindava in the Czech Republic. III. 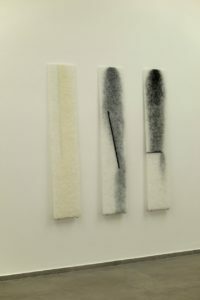 prize: Patricia Šichmanová (SVK), a graduate of the Academy of Fine Arts and Design in Bratislava. Her work entitled Fluidity focuses on the study of motion and kinetics, based on water movement, its variability and light properties. The jury praised the idea, the contrast between the composition and technique and its unusual execution. The third prize includes a two-day programme that includes a visit to the AGC Technovation Centre flat glass research centre in Charleroi, Belgium.